This course deals with groundbreaking achievements, milestones in the history of Western art from classical antiquity to the modern age. Each lecture concentrates on one work of that is paradigmatic of an epoch, but includes comparisons with related works and discussions on the historical, intellectual, and aesthetic background in which they originated. 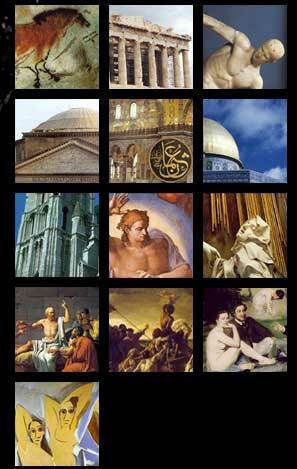 Major Works of Western Art is more comprehensive than art promotion and 'art appreciation' courses offered elsewhere. Students have the opportunity to consider the intricacies of human creativity and the complex factors in play in a work of art through the lectures and discussions. Such an exhaustive exploration should assist students in developing criteria for their appraisal of the arts, as well as stimulate them to reconsider their systems of values and to pursue their interests in the arts and humanities. For further information on the course see the Requirements and Readings. For the syllabus and descriptions of the individual lectures, click on the images.